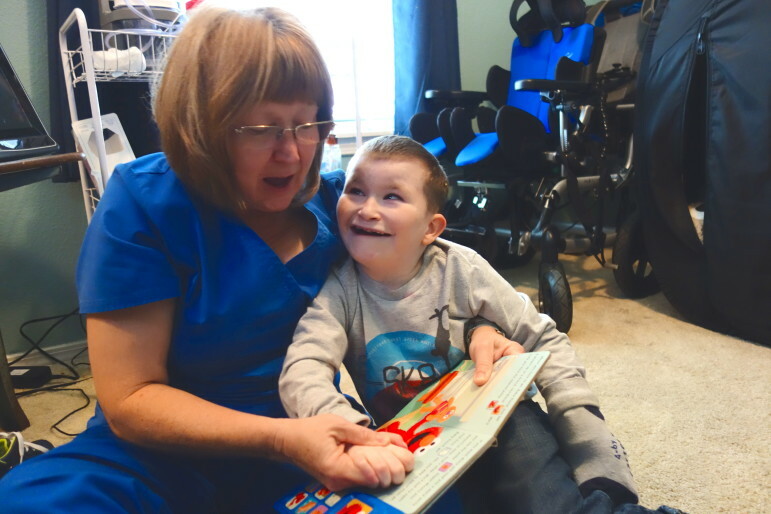 Home health nurse Rita Nuss reads a book to 9-year-old Josiah Melton, who has a number of chromosomal disorders and is on the Developmental Disability Services waiver waiting list. After decreasing last year, the waiting list for a state program that provides services to Oklahomans with developmental and intellectual disabilities has grown again, to the highest level ever. 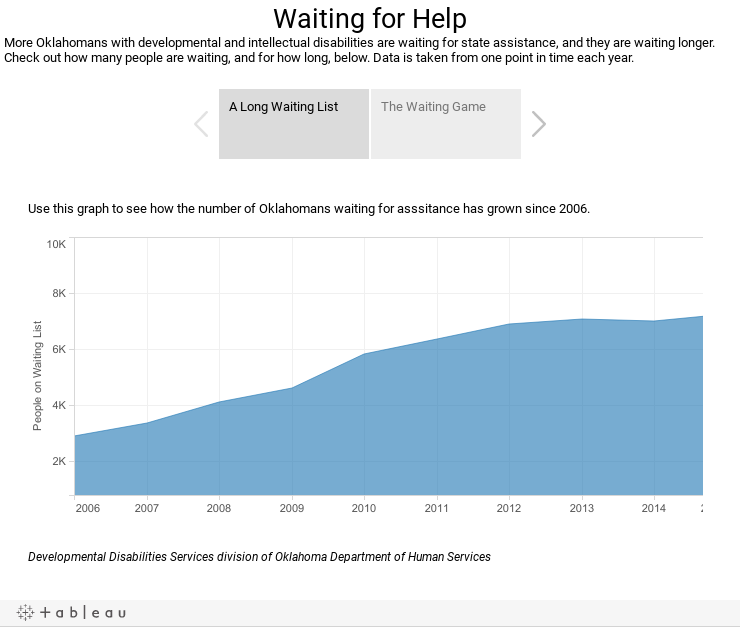 As of Oct. 15, the wait time for those seeking state-paid services for their developmental disabilities was nearly a decade, according to Oklahoma Department of Human Services figures. The number of people on the waiting list grew from 6,992 in July 2014 to 7,239 in October this year. The list could grow longer as increasing numbers of people apply for services and the state looks at more cuts in funding for programs because of an expected budget shortfall next year. Oklahoma uses state and federal Medicaid funds to pay for various services for the developmentally and intellectually disabled in provider-run community homes or their family’s home. Those needing services have conditions such as autism, cerebral palsy, Down Syndrome, brain injuries and intellectual disabilities. About half are children. Services can be long-term case management, home health aides, personal or medical care, therapy, vocational training or retrofitting of homes and vehicles for the disabled. There have been some efforts during the past decade to lower the wait time. The biggest occurred when the state Legislature appropriated a total of $3 million over the last three fiscal years to address the issue. The additional funding seemed to work. The number of people on the list dropped slightly, from 7,064 in August 2013 to 6,992 in July 2014, according to records from the DHS developmental disabilities services division. However, the Legislature cut off the additional money for fiscal 2016 because of a budget crunch. A more severe budget shortfall is projected for fiscal 2017, so hopes are diminishing that the waiting list can be reduced again, said DHS spokeswoman Sheree Powell. Interactive table by Nate Robson. A total of 5,610 Oklahomans were receiving services through the program in June. The state pays for services through a waiver granted by the federal government that allows Oklahoma to use Medicaid funds to cover treatment of the developmentally disabled in home settings instead of large institutions. The waivers stemmed from federal court rulings in the late 1980s that led to the closure of Hissom Memorial Center in Sand Springs. In 2012, Oklahoma decided to close its two remaining institutions for people with developmental disabilities and switch to a total community-based approach. Gov. Mary Fallin formed a panel in 2013 to reduce the waiting list. In March, the panel issued recommendations to improve services, including finding a way to prioritize those on the list, which is now basically first-come, first-serve. Fallin has since created two new groups. The current panel is charged with developing policy proposals, and an inter-agency council composed of government officials and cabinet members is to implement the proposals. Wanda Felty, who served on Fallin’s panel and is an advocate for developmental disabilities services, said that for every $1 million put toward the waiting list, about 300 people were taken off. But only around half of those actually were given waiver services, Felty said. The rest were removed after the department was unable to make contact with them. At the same time, the pace of applications has increased as more people learned of the waiting list on the Internet and through social media, Felty said. With that trend, and the loss of the $1 million in annual funding, the number of people on the waiting list has grown to a record high. Powell, the DHS spokeswoman, said while most of those on the list are also covered by Medicaid, the waiting-list program covers additional services that are often needed by families with adult children. In addition, the state’s Medicaid program cut provider rates this year by 3 percent to 5 percent, resulting in cuts to some services and to provider worker pay, and causing some providers to pull Out of the market, Powell and Felty said. “This has been extremely hard. We’ve had several provider agencies give notice. They just went belly-up,” Powell said, adding that DHS has tried to work with the providers to lessen the blow. Morgan said she, too, has seen a reduction in some of the services her son Josiah receives through Medicaid, such as the amount of time he is able to attend certain therapies and longer approval times for items like wheelchairs. Morgan said when her son finally gets off the waiting list, one of the first things she hopes to obtain is a wheelchair lift for her van. “We try not to take his big wheelchair because it’s very heavy, and I’m expecting another child,” Morgan said. She hopes that the eventual delivery of services will bring stability. Ten years is a long time to wait for available state help to improve the care of a developmentally disabled child or other relative. Some families despair, as captured in this moving “Oklahoma Watch Report” radio segment.